Since its first publication in 1995, Lies My Teacher Told Me has become one of the most important--and successful--history books of our time. Having sold nearly two million copies, the book also won an American Book Award and the Oliver Cromwell Cox Award for Distinguished Anti-Racist Scholarship and was heralded on the front page of the New York Times. What started out as a survey of the twelve leading American history textbooks has ended up being what the San Francisco Chronicle calls "an extremely convincing plea for truth in education." 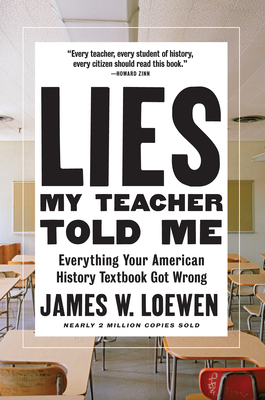 In Lies My Teacher Told Me, James W. Loewen brings history alive in all its complexity and ambiguity. Beginning with pre-Columbian history and ranging over characters and events as diverse as Reconstruction, Helen Keller, the first Thanksgiving, the My Lai massacre, 9/11, and the Iraq War, Loewen offers an eye-opening critique of existing textbooks, and a wonderful retelling of American history as it should--and could--be taught to American students. James W. Loewen has won the American Book Award, the Oliver Cromwell Cox Award for Distinguished Anti-Racist Scholarship, the Spirit of America Award from the National Council for the Social Studies, and the Gustavus Myers Outstanding Book Award. He is professor emeritus of sociology at the University of Vermont and lives in Washington, DC.